On March 2, the Bank of Canada became the latest central bank to weigh in on the monumental impact that climate change will have on humanity’s economic future. At a speech to the Finance and Sustainability Initiative in Montreal, deputy governor Timothy Lane laid out a series of challenges and opportunities that lie ahead for Canada. But Lane also explained that inaction isn’t a viable option, with the negative effects of climate change set to rise to between $21 billion and $43 billion by the 2050s. “While the coming shift does present some unique challenges, Canada has shown an ability to adapt,” he said. Much of this resiliency in the economy will need to come from small and medium-sized businesses, firms that do not have access to the same resources and capital as Canada’s largest companies. 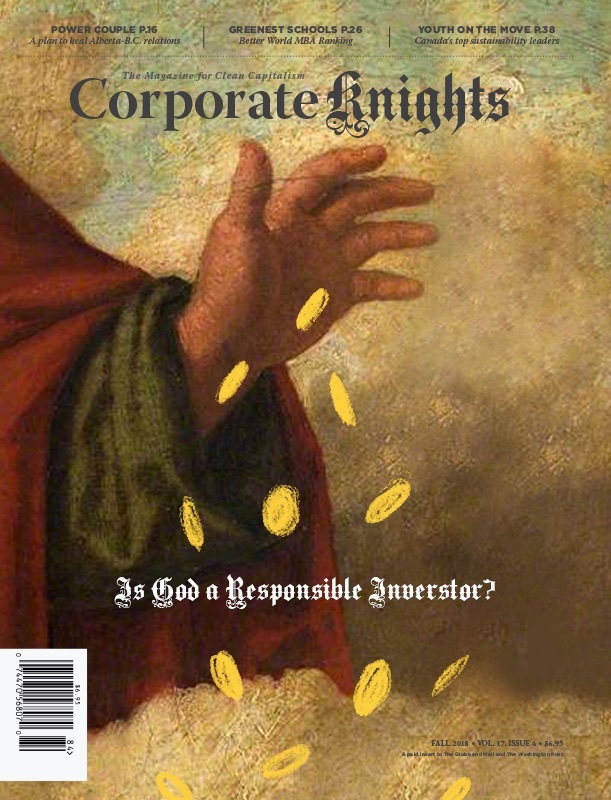 Four years ago Corporate Knights began the Future 40 ranking in an attempt to track which companies are successfully pivoting to this new low-carbon reality. The firms on this year’s Future 40 are a cross-section of corporate Canada’s strengths, with fully a quarter coming from the mining sector. The world is counting on metals and materials coming out of this sector to meet the growing demand for renewable energy to help combat climate change, but will need to become much more resource-efficient and attuned to concerns about social licence if it is to survive and prosper. Other sectors represented include medium-sized oil and gas players, which will be contending with carbon taxation in the years ahead. Several top universities also find themselves on the list, determined to lead by example as they equip the country’s future leaders with the knowledge and skills to succeed in a changing world. Utilities also figure prominently, led by top-ranked Toronto Hydro Corporation. The city-owned utility has had success reducing its carbon footprint in recent years, including a 24 per cent decrease between 2014 and 2015. While some of this was due to the final phaseout of coal power in the province, other steps like decreased emissions from its vehicle fleet and facility retrofits also played a factor. The company has also made progress through a pilot waste reduction project that has increased waste diversion 19 per cent in the past two years. Toronto Hydro rolled out a climate change adaptation road map in 2015, and has begun replacing infrastructure to increase resiliency with products like stainless steel submersible transformers. Along with teaming up with the city to install solar PV projects on municipally owned buildings, the utility has also moved forward on two promising energy storage projects – the HydroStor underwater compressed air energy storage system and an intelligent energy storage unit being developed by Electrovaya and a group of other partners. Next on the list is the University of British Columbia, followed by Manitoba Telecom Services (which finished 6th on last year’s list). The top five is rounded out by Algonquin Power & Utilities, as well as the 2016 top company Horizon Utilities, which recently completed a merger with several other utilities in the region to become Alectra Utilities. Although almost half of the Future 40 is headquartered in Ontario, companies hailing from six provinces are represented on the list. With a turnover rate of 27.5 per cent, a number of new companies surged into the ranking this year including Kruger Products, McGill University and Entertainment One.